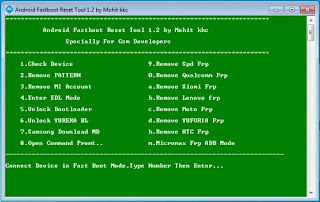 Hello' friends today we come up with the latest and updated Android Fastboot Rest Tool V1.2 BY Mohit KKC Full Setup here web page. It is download free of cost from at the right download link given below of this article.If you needed this latest tool and you want to download them so, don't worry now a day's you are come in a right place to download free. Just click the link given below and easily download them only a few seconds. If you are using a android smartphones, and you might stuck into a problems in which you needed to install the new operating systems to use your phones once again.So, today we have to share the awesome tool here.I have stuck into this many a times, i wonder, there should be one tool link Android Fastboot Rest Tool which can resolve all of this problems.Like pattern removal, IMEI Unlock, Mobile phone Sim lock, The amazing tool has been released with its more unique features given below. Here is the list of amazing and unique features of Android Fastboot Rest Tool given below. You can unlock bootloader of your any android phone. XIOMI FRP removal with just one click on this latest tool. It is HTC FRP Removal. With the help of this Sony FRP removal. IMEI change of any android phone. Basic info of any android version phone. You can easily Hardware/ Software info of any phone. Easily unlock the phone either Sim lock or Phone lock.